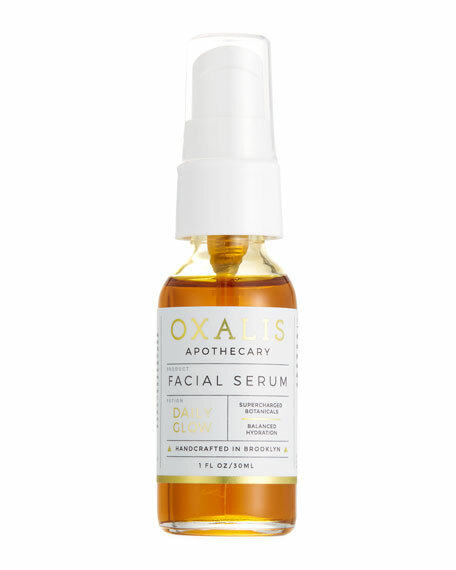 Oxalis Apothecary Facial Serum, 1.0 oz. Wonderfully balanced, noncomedogenic, gorgeously aromatic and packed with supercharged botanicals for healthy, radiant skin. Comprised of 100% cold pressed and unrefined oils, each carefully selected for their regenerative and therapeutic benefits. This facial serum is a delicate balance of base oils containing both linoleic and oleic acids, powerful botanical extracts and premium essential oils. Suitable for all skin types. Golden Jojoba Seed Oil: Lightweight, fast absorbing and mimics skin's natural texture (sebum). Antibacterial and anti-inflammatory, perfect for treating congested skin and smoothing uneven skin tones. Virgin Argan Oil: Rich in antioxidants, omega-6 fatty acids and Vitamin E, which combat wrinkles, acne, and maintain healthy moisture in skin. Rosehip Seed Oil: Extremely high in essential fatty acids and Vitamins C and E. Helps to replenish dry skin and reduce discoloration from scarring. Hemp Seed Oil: High in linoleic acid, omega-3 and omega-6 fatty acids as well as a plethora of proteins and minerals. With natural anti-inflammatory properties, it is ideal for treating troubled skin. Pomegranate Seed extract: Powerful antioxidant that improves skin elasticity and protects against sun damage and premature aging. Pro tip: Use our Rose + Neroli Toning Mist prior to applying serum for added hydration + botanical benefits. 30 mL/ 1.0 fl. oz. clear glass bottle with treatment pump. For in-store inquiries, use sku #2289420.